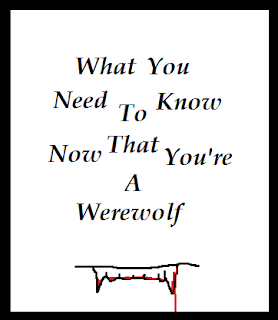 There's no guidebook, at least none that I've found, with any practical information to help you get through the first few awkward months after you've become a werewolf. There aren't any helpful scientific facts like: this condition affects 1 in every 300,000 people. I should know too, I've looked. What does exist is a lot of ridiculous ideas made up by people who clearly don't know what they're talking about. So, as someone who has been dealing with the condition for years, I thought I would take it upon myself to draft such a text. Hopefully it'll help any of you who may be experiencing it for yourself. The first lesson, law, rule, whatever you want to call it, comes courtesy of my creator. It happened one quiet evening when I was out for a walk. It was in a busy park where a lot of people come and go most hours of the day. I was in one of the quieter areas, away from the street when I was attacked. He had me by the leg and would have torn me apart if not for an old lady who happened around the bend at that moment. She hobbled over quickly and began whacking away at it with her cane. Never underestimate old ladies. Others might be quick to run thinking only of their own skin, but old ladies are often fearless. While I was carted to the hospital, animal control located the wolf, tranquilized him, and took him in for examination. They quickly assessed he was rabid, and a young man was tasked with putting him down. In the morning when the body was to be taken disposed of, instead of a wolf they found the body of a middle aged man. The poor guy who had euthanized the wolf, couldn't explain what had happened. He was eventually charged and convicted of murder. Later on when I understood what had happened, I held my silence. I was too afraid of what they would do to me should I reveal what I was. I suppose you could say that's the one life I'm responsible for taking. But I digress. What can we take from the incident? Wolves, even of the were kind, aren't prone to attacking humans like that. I know that goes against what you've learned watching every horror movie, but it's the truth. Even if it's a big scary wolf you turn into, a wolf's a wolf. I was attacked because my creator had rabies. So the most important thing to remember when you're a werewolf? Don't get rabies. Now that you've got my history, I'm going to skip ahead. I don't feel like we need dwell on the months of weirdness that followed for me. As I said, there were no helpful guides. I struggled step by step to learn a way to cope with my condition. No, we can skip that. Instead I shall, with the help of my trusty handheld recorder, walk you through normal transitional period for me. Even as I speak, the sun is setting and soon will begin my transformation from man to beast. The first thing you'll need is a quiet, undisturbed location. For me, that's my house. In particular my basement, where I'm also afforded the luxury of a little sound dampening. Important if you don't want the police called on you by one your neighbors. Once, in the basement, the door in locked behind me. It's alright to have the key, wolves don't have thumbs, so that won't be an issue. After that, it's a matter of securing oneself. A word though if I might on cages: Don't. I tried it just once. The problem is you can't control what you do as a wolf, so if you get separated from the key to the cage, you're screwed. I would have died in there if my mom hadn't popped in for a visit the next day. Oh, wasn't that an awkward conversation... Nope, unless you have a friend who knows all about your condition and can let you out, avoid cages. Instead, as the light outside the narrow basement window fades, I slip into my harness. I've tried chains and shackles, but they present another problem. The resizing. Either you'll slip right out of them, or worse, you end up growing bigger, and crack a bone or two. Thank God I discovered it trying my arms out before I attempted a collar, or else I would probably have strangled myself. My harness slips on like a vest and ties shut in the front. It's a nylon material with a little stretch to it. It keeps things tight, but not painful. Attached to the vest is a heavy chain I've bolted to the wall. The best part of this setup is, as a wolf you can chew through a lot of restraints, but try getting at something fitted over your legs. I'm secured now, and it should be any minute. Most of what happens when you're a wolf, you won't remember. It's a lot like dreaming. 90% of the time you won't even remember the night's events, or if you do it's just a fraction. Though occasionally something will happen that'll jog your memory. Even so, and this might sound silly, I like to leave around a couple chew toys. I don't know if I use them, but I like to think that I have something to amuse myself with when I'm a wolf. I've awoken on my couch. This is not a good sign. I can see that my vest held secure, however the chain is broken and dangling from it. There's a new lesson learned. Always check your equipment and practice quality control. The room is a mess. My bed is covered in filth and wolf hair. My pillows are torn up and there are feathers everywhere. Heading downstairs I see an even worse mess. The kitchen is destroyed. The cramps in my stomach are an indication of what I know to be, even before I see the mess on the floor; I've been eating from the garbage again. Looks like I found the bucket of KFC bones. Could be worse, one time I actually ate a swatch of my living room carpet. I check all the doors and windows. This is an important point I should note, always make sure to secure everything just in case. The good news is, I didn't find a way out. I spent the night in. A lot to clean up, but no harm done to anyone else, and with the exception of what's bound to be a painful day in the bathroom, I seem to be alright. The door to the basement definitely isn't though. It was old and I managed to exploit a small crack in the frame. Just enough to squeeze through. Easy enough to replace though. Next time I'll make sure it's a stronger door. The answering machine. I didn't even hear the phone ring. Hi Thomas, this is Kathy. Ah, the girlfriend (yes you can have those, you just have to be careful). I couldn't get hold of you yesterday. I guess you were already out with your friends. I just wanted to let you know I dropped Fluffy by your place last night. Don't worry, I locked up behind me. She was in heat, and it was driving the male dogs I'm training mad. I forgot, I told her she could drop off Fluffy the next time. I put her in your four seasons room, just for the night. I hope that's alright. I'l be by to pick her up later today. Love you, bye. I know what you're thinking, I'm a werewolf, and she's a dog trainer, but it's nothing like... Wait, Fluffy? Quickly I race to the four seasons room. Just a little unheated room between the house and the garage. Sure enough the door is broken down. Fluffy looks up at me with tired eyes. Memories are flashing through my mind as I remember my last nights activities. A sickness welling up in my stomach beyond the KFC. Young wolves, hear me now and hold to these words. Forget rabies. Here's the number one thing you need to know now that you're a werewolf. Never -under any circumstances whatsoever- never, be around a dog that's in heat. I guarantee it's a lesson you'll never forget for the rest of your life. This story is in conjunction with the Scare Me! Blogfest hosted by Scifi Media Why not head over there for more Halloween goodies? I love it. A werewolf with rabies. Who would have thought? Great story. very funny. Thanks for joining in on the fun. Must've been very awkward when your mom found you. Don't get rabies - check! That damned opposable thumb thing...Scooby Doo always managed somehow. 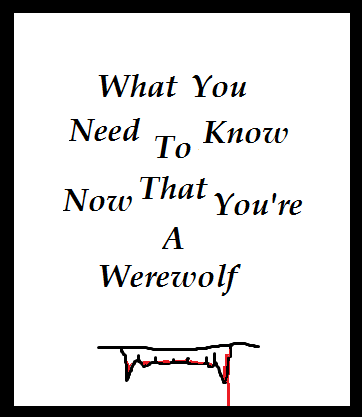 Great primer for werewolves...now I just need to find a creator!! One hell of an ending, haha! Here, I thought he'd just eaten Fluffy. This is good, a fun read. Great story and amazing ending!